We constructed a 4D atlas of the developing brain, between 28 and 44 weeks post-menstrual age at time of scan, using T1 and T2 weighted MR images from 204 premature neonates. The method used for the creation of the average 4D atlas utilizes non-rigid registration between all pairs of images to eliminate bias in the atlas toward any of the original images. In addition, kernel regression is used to produce age-dependent anatomical templates. A novelty in our approach is the use of a time-varying kernel width, to overcome the variations in the distribution of subjects at different ages. This leads to an atlas that retains a consistent level of detail at every time-point. Comparisons between the resulting atlas and atlases constructed using affine and non-rigid registration are presented. The resulting 4D atlas has greater anatomic definition than currently available 4D atlases created using various affine and non-rigid registration approaches, an important factor in improving registrations between the atlas and individual subjects. Also, the resulting 4D atlas can serve as a good representative of the population of interest as it reflects both global and local changes. Note that tissue probability maps (brain mask, cortex, white matter, subcortical gray matter, csf, brainstem and cerebellum) can be used with both T1 and T2 templates. This atlas was constructed using T1 and T2 weighted MR images from 204 premature neonates (no preterm babies had visually obvious pathology). The age range at the time of scan was 26.7 to 44.3 weeks post-menstrual age, with mean and standard deviation of 37.3 ± 4.8 weeks (see histogram in Fig. 2). All subjects were born prematurely, with mean age at birth 29.2 ± 2.7, range 24.1 − 35.3 weeks PMA. 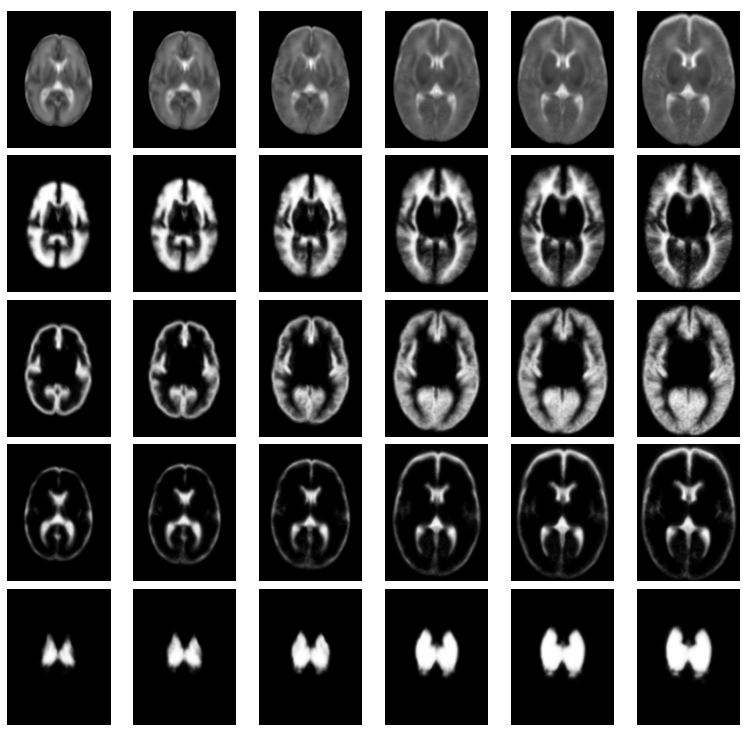 The images were acquired on 3T Philips Intera system with the following parameters: (1) T1-weighted 3D MPRAGE: TR = 17 ms, TE = 4.6 ms, inversion delay = 1500 ms, flip angle = 13◦, acquisition plane = sagittal, voxel size = 0.82 x 1.03 x 1.6 mm, FOV = 210 x 167 mm and acquired matrix = 256 x 163; (2) T2-weighted fast spin-echo (FSE): TR = 8700 ms, TE = 160 ms, flip angle = 90◦, acquisition plane = axial, voxel size = 1.15 x 1.18 x 2 mm, FOV = 220 mm and acquired matrix = 192 x 186.